Rotary Club of Jersey - welcome! Please scroll/swipe down through this page to find out more about us, in addition to the pages linked in the menu, top-left. Dinner Meeting - October 24 Dinner (Pomme d’Or) Amy Bryant, Deputy Head of Jersey finance. David Pirouet and others from Christmas Appeal will also give a short briefing. Welcome to the Rotary Club of Jersey. Rotary is a world-wide organisation of active men and women who are looking to give something back to their communities, both locally and internationally, and enjoying fun and fellowship while doing so. Our motto is ‘Service before self’. We believe that a strong community comes from supporting one another, and we are involved in projects, large and small, focussed locally, nationally and throughout the world. I am delighted to be President of the Rotary Club of Jersey for the year beginning 1st July 2018. Our Club was created in 1924. We meet twice each month with lunches on the 2nd Wednesday, and dinners on the 4th Wednesday. Our regular meetings provide members with an excellent opportunity to get to know each other, form friendships and make things happen. If you would like to know more about our Club then please contact us through the link below. We can then invite you to one of our meetings. Please also feel free to explore our website for a taste of the many and varied activities the Club undertakes. Please follow the "What We Do" menu above to see all the work we do in the Community and feel free to explore all the other menus too. We support Local and International communities by offering our time and expertise as well as goods and funds to promote wellbeing in communities worldwide. Follow these links to learn more. Local - International - Youth. Our own direct contribution to Island Life, the Good Companions Club. Run by Rotary for over 60 years, providing a social hub for the young at heart. Interested in what we do? Have a look at the video below. 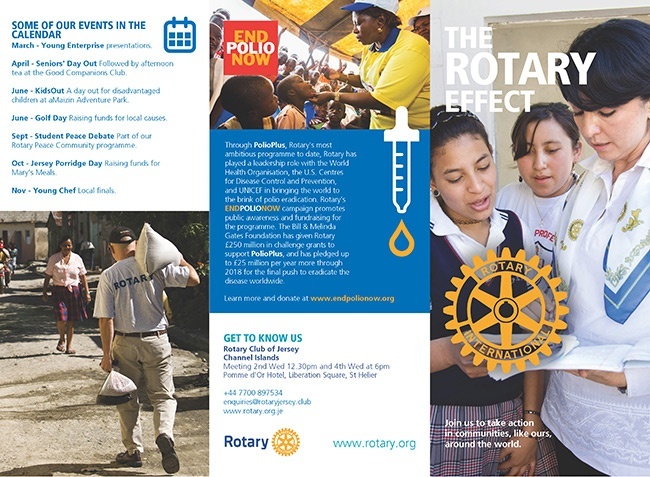 Join Rotary and make a world of difference to your own community, to the lives of those less fortunate around the world, to your fellow club members - like-minded men and women of all ages - and, just as important, to yourself! The projects Rotarians get involved in are incredibly fulfilling, worthwhile and rewarding - and there's plenty of fun involved too. Do download our club information leaflet. Email us on enquiries@rotaryjersey.club it would be great to hear from you.